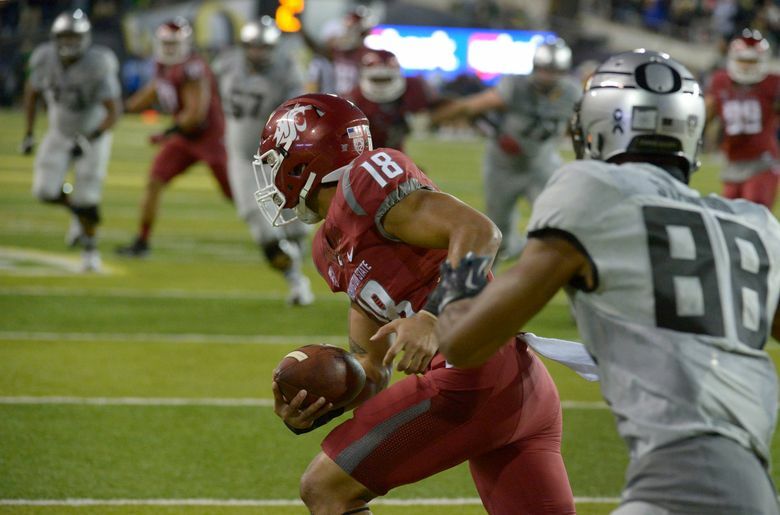 Washington State free safety Shalom Luani was once a soccer star for American Samoa, but his footwork and instincts have translated well onto the football field, where he has become one of the Cougars’ hardest hitters. Shalom Luani is no stranger to big performances in big games. Way before he secured the game-winning interception in Washington State’s win at Oregon last weekend, the Cougars’ starting free safety was best known for the game-winning goal he scored as a 17-year-old forward for American Samoa against Tonga in a November 2011 World Cup qualifying match. Luani’s 74th-minute goal that day gave the Samoans a 2-1 win, their first-ever FIFA-sanctioned victory. Four years later, Samoa’s all-time leading goal scorer has become a star for a very different kind of football team. Originally committed to Oregon State, whom the Cougars play on Saturday at Martin Stadium, Luani flipped his commitment to WSU after former coach Mike Riley left the Beavers last December to take the coaching job at Nebraska. The 6-foot-1, 201-pound Luani came to WSU from City College of San Francisco as the top-ranked junior college safety in the country, and has made an instant impact in the Cougars’ secondary. Through five games, Luani leads WSU’s defense with two forced fumbles, is tied with Jeremiah Allison for the team lead with 25 unassisted tackles, and has acquired a reputation as the hardest hitter on the team. Cougars’ coach Mike Leach says Luani might well be the hardest hitter he’s had on the team in his time at WSU. Luani captivated Leach right from the moment the coach hit “play” on his highlight reel. Every college coach who has worked with Luani says the safety’s soccer background has translated very well to the football field. “You watch him and he rarely has a false step in changing directions,” said City College coach Jimmy Collins, who credits Luani’s soccer skills for his superior footwork in man-to-man coverage. Luani’s journey to Washington State started back in his hometown of Masausi, American Samoa, where he learned to play football at Faga’itua High – which also produced Cougars defensive tackle Robert Barber. Luani quickly fell in love with the physical nature of American football and ultimately gave up soccer to pursue his new passion. 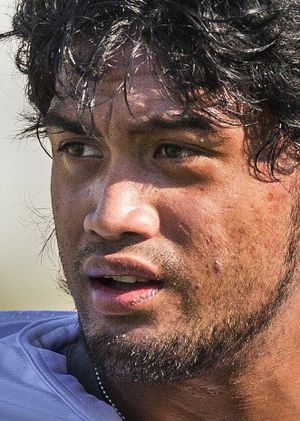 But coming out of high school in 2012, Luani wasn’t polished enough for Division I football. So his first stop was Chabot College, a community college in Hayward, Calif.
Luani never played a down in uniform for Chabot College, however. His living situation in Hayward fell through, Calcagno said. So in spring 2013, Luani called City College to inquire about playing there. Collins said he knew Luani would be a star from the get go when he watched the safety break nimbly on an out route on 7-on-7 drills in shorts and T-shirt in offseason drills. “His instinct is something you don’t find often, especially at our level,” Collins said. Luani has demonstrated a knack for forcing turnovers and making big stops and is hard to miss on the football field. But off the field, he is so quiet and unassuming that when WSU linebacker Peyton Pelluer first met the Samoan safety, he thought Luani was a freshman. The safety’s humble personality also means he seldom talks about his soccer adventures, and until this week, most of his teammates had no idea that they were sharing a locker room with a Samoan soccer legend. It took Luani a couple of games to find his rhythm with the defense, but if the Oregon game was any indication, the Samoan is finally getting comfortable in his free safety spot.